We’ve good friends who have a Friday night tradition of Clams Linguini. Catholic, of course. Religion aside, I like that tradition. 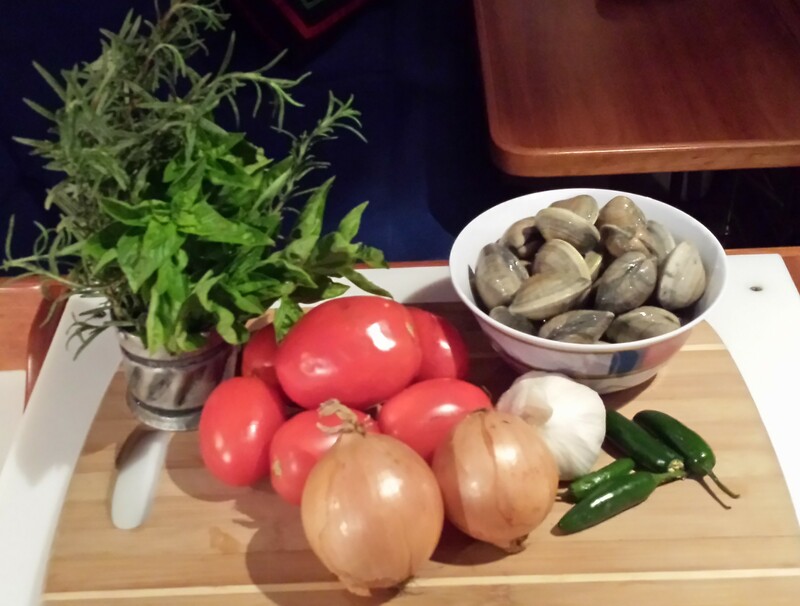 So I’d like to share a Galley Pirates spin on Clams Linguini. 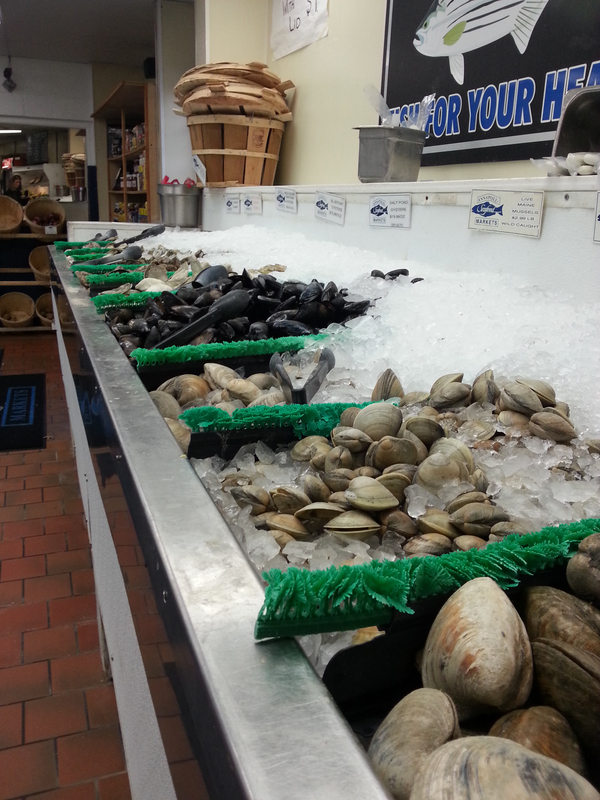 First we head over to Annapolis Seafood to pick up some Little Neck clams. Make sure the clams are tightly closed and roughly all the same size. Don’t ever buy a bi-valve that is open or doesn’t snap shut when you touch it. They would be spoiled (dead). As you’ve rightly assumed from earlier posts, we Galley Pirates like our bacon. So we think that the base of many good dishes starts with bacon fat. And so it goes with Clams Linguini. (although I think we’ve disrespected all religious traditions with the use of bacon fat.) Use olive oil if you’d prefer. 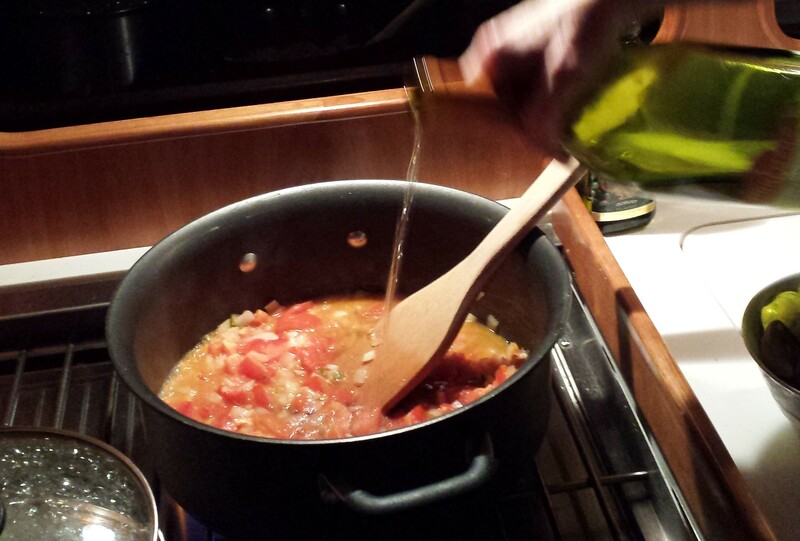 Heat the bacon fat and olive oil in a large pot on your galley stove. Chop the onions. Mince the garlic. Sauté onions and garlic in the oil mixture. Meanwhile, chop the tomatoes and the hot peppers. Add to the pot along with the capers and continue to sauté for 15 minutes. Add the wine (or chicken broth). Bring to a slow boil and add the clams. 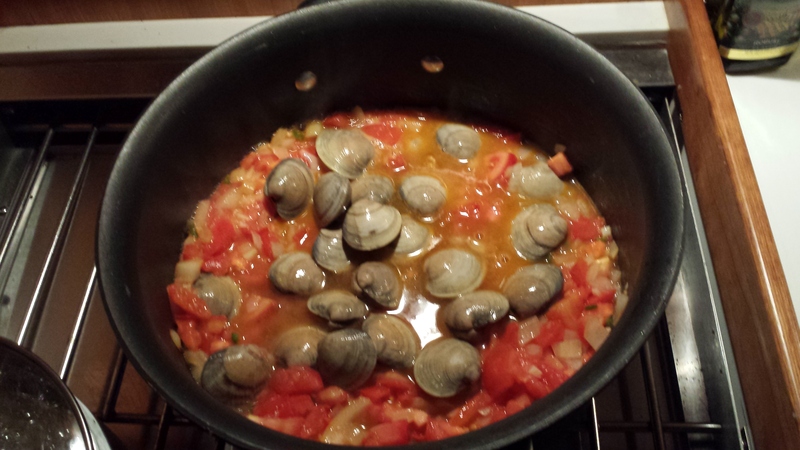 Cover and simmer for 10 minutes until the clams have opened and their juices are blending in with the sauce. Turn off the burner. Adjust the seasonings with sea salt (less if you used chicken broth) and pepper. Add the fresh herbs. You can serve this clam sauce ladled onto the individual beds of linguini. But I like to mix the linguini in with the sauce so the flavors soak into the pasta. Serve with an Italian Pinot Grigio and a Caesar Salad. Happy to report that Christian Scientists have nothing against bacon at any time. This looks DELICIOUS…anytime something’s juices are blending with a sauce, I’m in. This Catholic wishes she could prepare this dish, at least once during Lent.